Portland Street was built in the 19th Century, and almost completely lost 100 years later. It was built to fill a gap between the Westbury Manor gardens (Hartlands Road) and what became the cattle market. 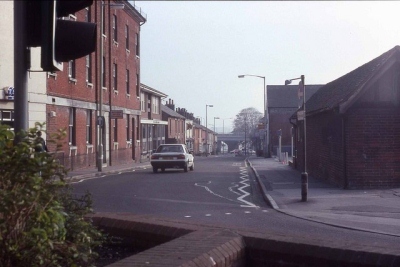 Wider than Quay Street (and therefore the most important of the three roads south), it adopted the role of being part of the A32 prior to the opening of Wallington Way in 1986. In the 1960s, a one way system was formed which saw it and Hartlands Road running northbound only. When West Street began to be pedestrianised, this changed to southbound only, and lasted until 1993 when the pedestrianisation was extended and Portland Street became a cul-de-sac. Between 1906 and 1929, it formed part of the Gosport and Fareham Tramway. It took its name from the portland stone which is used in and around Fareham. The 19th Century housing which lines the street provided small shops along the length of it, the most popular of which included the Elms family pet shop and fish and chips. The Portland and The Toby Jug existed as pubs. Much of these buildings had problems with damp. At the top of the road stood the grand Portland Hall, at one point the town hall, still recognisable today as the solicitor's. Opposite was the bus station, which was built in place of Thackery Cottage in 1931 as the need to travel grew. A few of these houses survive today, hidden behind Portland Hall. A gap in the (mostly terraced) houses allowed for the construction of the Roman Catholic church at the end of the 19th century. At its southern end, it merged with Hartlands Road to meet Gosport Road. A builders yard set up here in 1940s. The first changes came with the cattle market. In 1966, the map changes its label from "Cattle Market" to "Cattle Market (car park)". A new entrance was built in place of numbers 25 and 26. By the 1988 map, the label "Cattle Market" had disappeared completely, and the cattle market buildings are no longer shown, but we know the market continued. 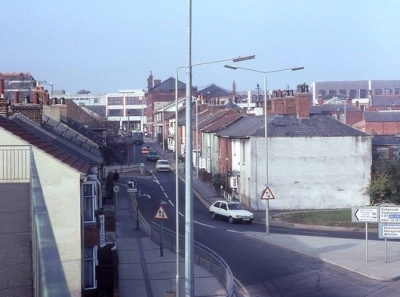 In the 1970s, the Quay Street Roundabout was built at the southern end, leaving Hartlands Road disconnected. The top of the roundabout is exactly where the entrance to the car park was, meaning only about seven properties on the east side were demolished, and about three on the west side. Behind the church, a new link road was built to allow Hartlands Road to keep its northbound flow, requiring another three properties to go. The majority of the street was then demolished to allow the car park to expand. In 1993, as Fareham town centre expanded, the main flow was moved on to a now two-way Hartlands Road. As such, the road between Hartlands Road and the roundabout was dualled (seeing a few more remaining houses demolished), with the rest of Portland Street now a shadow of the small, important section, used only to access car parks. In 2004, the road and its car park were cleared as part of the Market Quay development. For this reason, now only a small, dualled section of Portland Street with a few houses remained.